What is the Fry readability formula? Fry is a formula used to calculate the US grade level required to understand a piece of text. Sounds familiar - that’s because this is the aim of most readability formulas. What makes Fry different from many is how it calculates this. Fry is a graph-based formula. It uses sentences and syllables as variables. Numbers which fall into the dark blue areas labeled ‘long words’ and ‘long sentences’ fall outside of the graph’s parameters and can’t be scored. The placement on the graph was originally determined by a process of sampling excerpts from the text in question. This was three sets of 100 words from which the average number of sentences and the average number of syllables were taken. These two figures were then plotted onto the graph. The area where the two lines from these figures intersect was taken as the approximate reading grade level of the text. Where did the Fry readability graph come from? The Fry readability formula was created by Edward Fry who published it in 1968. Fry contributed greatly to reading and readability research. He was director of the reading center at Rutgers University and president of the National Reading Conference. Throughout his career, he became an authority on how people learn to read. He also lent his skills to supporting literacy development in Zimbabwe and Uganda. Whilst he was teaching in Uganda, he created the Fry readability formula as a ‘formula to save time’. He promised ‘reasonable accuracy and uncommon simplicity’ when using the graph. He clarified that accuracy is within a grade level, which is handy for educators or librarians who want to calculate reading age confidently. He also assured that it correlates very well with other highly regarded formulas such as Dale-Chall, Flesch Reading Ease and Spache. How is the graph calculated? Select three one-hundred- word passages from near the beginning, middle and end of the book. Skip all proper nouns. Count the total number of sentences in each hundred-word passage (estimating to the nearest tenth of a sentence). Average these three numbers. Count the total number of syllables in each hundred-word sample. There is a syllable for each vowel sound; for example cat, black-bird, cont-in-en-tal. Don't be fooled by word size; for example po-li-o, through. Endings such as -y, -ed, -el, or -le usually make a syllable, for example: read-y, bott-le. Count every syllable over one in each word and add 100. Average the total number of syllables for the three samples. Plot on the graph the average number of sentences per hundred words and the average number of syllables per hundred words. Most plot points fall near the heavy curved line. Perpendicular lines ark off approximate grade level areas. This would have been comparatively easier than other formulas of the time. Luckily, it’s now even easier to calculate the Fry formula. We take the hassle out of your hands. 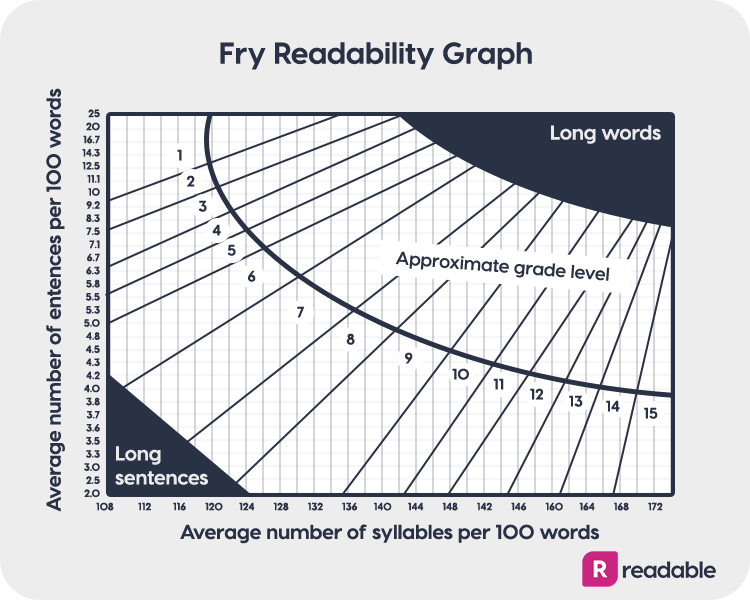 ReadablePro analyzes the text as a whole and gives you your Fry score as a US grade level within seconds. When is the Fry formula most useful? Unsurprisingly, as Fry was passionate about reading research and development, the Fry formula is particularly useful in education. With a wide range of grading, it can be used for elementary to college level texts. Fry is also one of several formulas used in healthcare. It can’t be overstated how important readability is in the healthcare industry to ensure a healthy population. Clear communication is key, whether used within diagnosis or in ongoing correspondence between doctors and patients. Studies have shown that patients who don’t understand health literature are less likely to follow instruction for their care. They may therefore not fully understand their illness and have poorer health as a result. The Fry formula is also important in legal matters. Fry points out that the matter of readability has been pointed out in court cases. In his example, he discusses a court case regarding insurance policies. The claimant concerned in the case got nowhere near the payout they were entitled to because of the way the insurance policy was worded. This was of particular concern because the claimant was elderly. Legal services pointed out that just under half the elderly population of New York had a less-than-ninth-grade education. Edward Fry himself testified that their documents were written at college level. By doing this, the insurance provider was undermining the rights of citizens to clear information. The outcome of the case was that the insurance provider had to take ‘prompt action’ to improve the readability of their documents. For the same reason, readability has been discussed in cases regarding texts such as government documentation, private contracts and warranties. How can the Fry formula help me? The above examples show that although readability formulas are extremely valuable in education, they don’t stop there. Edward Fry and other readability experts paved the way for creating essential tools for writers. 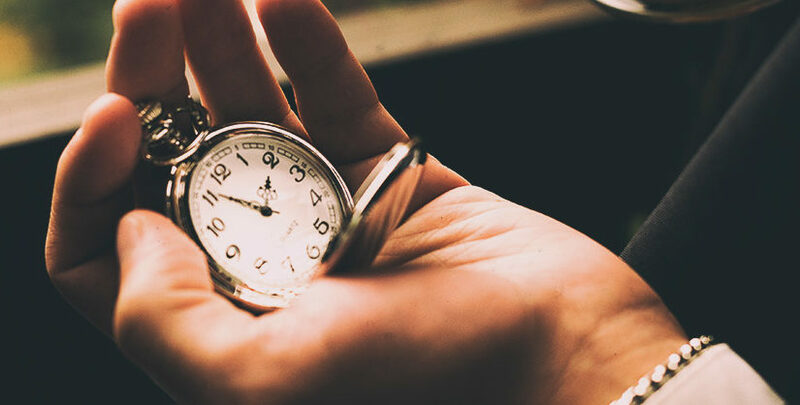 ReadablePro uses Fry, along with a bespoke range of other well-respected algorithms, to give you a readability rating which is easier than ever to understand. The Fry formula can tell you the grade level your audience have to be to understand your text. This can help you to clarify your writing, helping you to be clear, concise and readable.